Catherine Caldwell, Associate Director of KMDP, holds an MA in Arts Administration from UNO and is currently a member of the dance faculty at NOCCA and Dancing Grounds. She is a lead artist with Junebug Productions and a Yoga Alliance certified teacher. Catherine has trained with UBW’s SLI and Choreographic Center, the Bates Dance Festival and the Martha Graham School Teacher Workshop. She currently performs with KMDP and shares a 2016 Big Easy Award. Chanice Holmes is a New Orleans native dancer, performer, choreographer, educator earning a BFA in Dance from Hollins University. She has worked with Urban Bush Women, Ballet Hispanico, Forsythe, Complexions, T. Lang, Dr. John, Gris Gris Krewe, KM Dance Project, Narcisse|Movement Project, Activism Dance Theater, B.U.K.U Dance Krewe and is signed to Schooling Talent Agency. She is a dance instructor at Arise Elementary, Dancing Grounds and NOBA, under her brand IAMCHANICE. Jeremy Guyton is a dancer, choreographer, and teaching artist currently serving as the Youth Programs Director at Dancing Grounds. A Los Angeles native, he attended Georgetown University where he received a B.A. in Theatre and Performance Studies in 2012. Most recent credits include Foreign to Myself (Goat in the Road Productions) and Gomela/ to return (Junebug Productions). Kristal “M2DaE” Jones is a New Orleans native, choreographer, performer, working artist, and Architectural Designer. She is currently an adult Hip Hop instructor and special events coordinator with Dancing Grounds and offers both youth and adult workshops. Kristal performs with Artivism Dance Theater, is signed to Schooling Talent Agency and serves as founder and Director of B.U.K.U. Dance (Be. U. Know U. ), a hip hop krewe and motivational brand. Lauren Ashlee Small, originally from Springfield, Illinois, received her MFA in Dance from Belhaven University, where she served on faculty teaching modern dance and performance technique. Trained in the Ailey School’s professional division scholarship program, Lauren is a member of the Marigny Opera Ballet. Here, she has performed works by Teresa Fellion, Maritza Mercado-Narcisse, Nikki Hefko, Diogo de Lima, Maya Taylor, and Seán Curran. Lauren is also proud to with the New Orleans Dance Network. 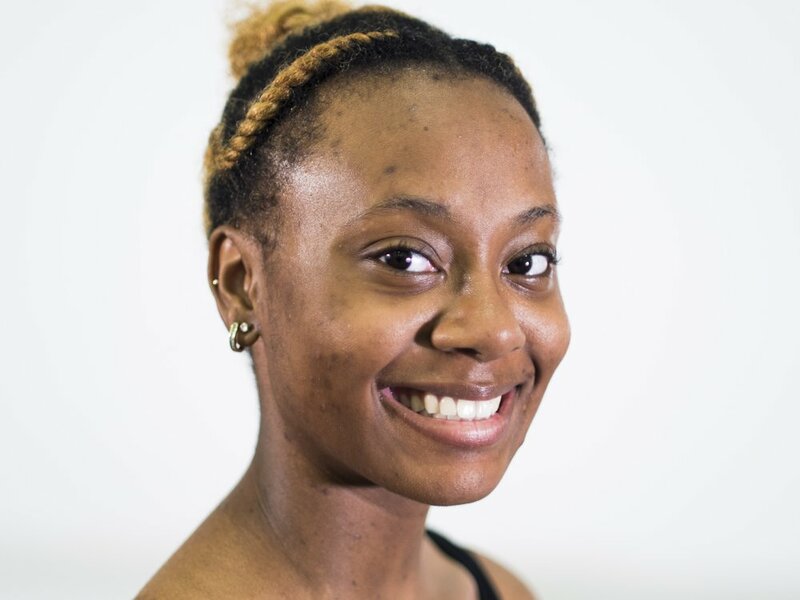 Milli Brown, a New Orleans native, trained under the direction of Kris Cangelosi at Cangelosi Dance Project and danced in the professional company for eight years. In 2016, Brown graduated from SLU with a degree in General Studies with a concentration in art and minor in dance. She has since moved back to New Orleans to pursue her dance career and is currently dancing with KM Dance Project. Randall Rosenberg is from Louisville, KY, and moved to New Orleans in 2006. He directed and choreographed for The Asylum Dance Crew and trained with Liquid Rhythm Inc, under Derik and Mariangel Dollis. He is a member of KMDP and BUKU Dance Krewe, as well as KMDP’s website designer. He is the Associate Director of Youth Programming for Dancing Grounds and is currently teaching adult and youth- Hip-Hop. Teddric Matthews is a native of Houma, LA, and has lived in New Orleans for three years. He earned a bachelors in Theatre from NSU, and a masters in Clinical Mental Health Counseling from Xavier University of New Orleans Production credits include Into The Woods, The Buddy Holly Story, White Christmas, The Nutcracker, CATS, various dance ensembles and concerts. Aminisha Ferdinand is a native of New Orleans, working with KID smART to integrate theater & dance into school curriculum while collaborating with arts educators on race and power in teaching. Following twelve years in the field of arts education, Aminisha is re-emerging as a performing artist with a developing lens on honoring her multiple identities through text and movement. She has performed in theater and film in New York, Los Angeles and New Orleans. Edward Spots a New Orleans native, graduated from Walnut Hill School for the Fine Arts, then toured with Ailey II, Urban Ballet Theatre, Delaware Dance Company, the Claudia Schreier Project and the Marigny Opera Ballet. He has trained at the Washington Ballet School, Joffrey Ballet School, NOCCA, NORD/NOBA, Schramel Conservatory, and The Ailey School. He has appeared in Dance Magazine, Essence Magazine, on So You Think You Can Dance, NY Times, Bulgaria Dancing with The Stars, and the National Geographic. Celine is a N.O. native began her training at Kelly's school of dance and Crescent City Gymnastics. She furthered her training at NOCCA and NOBA and has had the opportunity to perform with the Martha Graham project, Nutcracker and many projects in the N.O. dance community. She is a senior at NOCCA and plans to graduate, attend college and major in dance. She is very happy to be working with KM Dance Project under the supervision of her mentor Kesha McKey. Ceylon Seiber a N.O. native began her training at Kelly's school of dance and Crescent City Gymnastics. She furthered her training at NOCCA and NOBA and has had the opportunity to perform with the Martha Graham project, Nutcracker, NBA Stingers and many projects in the N.O. dance community. She is a senior at NOCCA and plans to graduate attend college and major in dance. She is very happy to be working with KM Dance Project under the supervision of her mentor Kesha McKey.